Mick McConnell, VP of design at Samsung Electronics America, dreamed up the pilot program after a visit to Apple's Genius Bar, reports Fast Company. The appointment started an hour and a half later than it was supposed to, an issue sometimes common at highly trafficked metropolitan Apple retail locations. Instead of waiting in an Apple store, milling around product shelves or browsing the web on a Mac, Samsung's plan is to furnish users with a workspace complete with a large black steel and glass box outfitted with computer workstations, coffee and fruit-infused water. 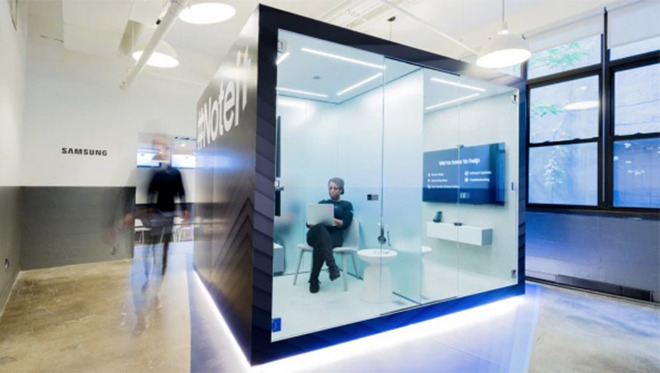 Set to open this month at WeWork locations in Detroit, Miami, and New York, the dedicated Samsung care center areas also feature phone booths with Samsung video conferencing systems. "Service is a hassle. I know I'm going to have to take time out of my day to do it," McConnell said. "The concept was, if I take time out of my day, at least I can sit in a conference room, make phone calls, and do work, as opposed to sitting in a busy room with a bunch of angry people." Though Samsung is taking up a chunk of those particular WeWorks, the goal is not to create a separate entity inaccessible by WeWork customers. Instead, the company wants to welcome subscribers (WeWork sells space on a monthly basis) into the Samsung fold, hopefully garnering new customers by doing so. Samsung will also host a series of after-hours talks at the WeWork spaces, eerily similar to Today at Apple learning sessions. The project has a ways to go before it is able to compete with Apple's Genius Bar, or Genius Grove, depending on the store you frequent, as Samsung care center customers are limited to "tier 1" support. That means customers can only receive technical help on owned products and mail-out repairs. Apple currently offers "tier 2" support, which covers screen replacements and other on-site jobs that require specialized personnel.